I have a confession to make: I keep a jar of salted caramel sauce at the ready at all times. Ask anyone who’s dropped by for an impromptu dinner, Thanksgiving, or a backyard BBQ I always pull out a jar of salted caramel. It’s a habit I’m desperate to break because when the guests leave I devour the rest of the sauce and carry the reminder of my indulgence around my waist. I have been staring at a jar of salted caramel for far too long without diving in. I know that my will power gets weaker with every day that passes. Friends were coming over and I was determined to use the salted caramel in a dessert and be rid of my temptation…well at least for a month or so. 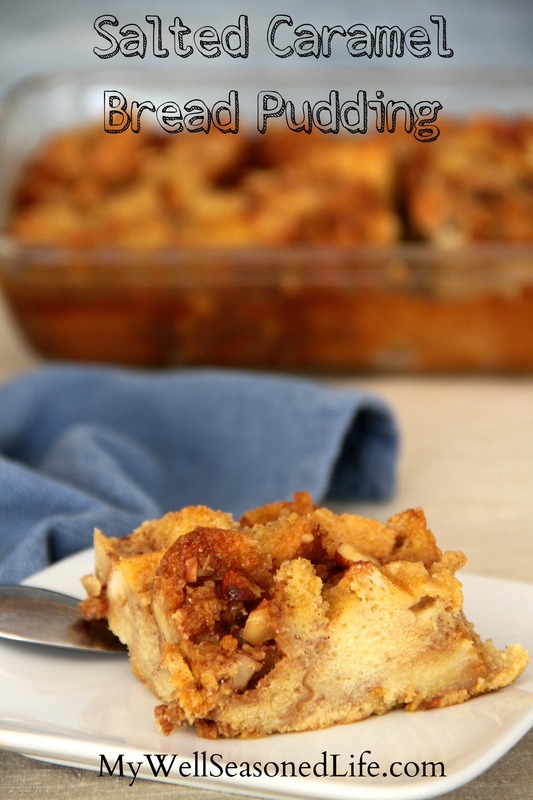 Bread pudding is a crowd pleaser, why not add the salted caramel sauce to the bread pudding? And add almonds to the salted caramel. Sounds like a win win. And like that, salted caramel bread pudding was born. 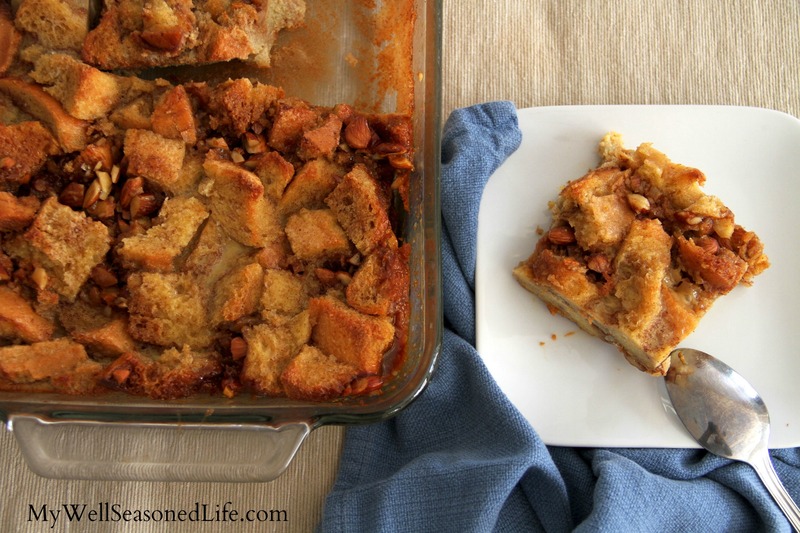 This salted caramel bread pudding is over the moon delicious. Sadly, there’s still a bit leftover, so I feel obliged to tidy up the baking dish. Add sugar to a sauce pan and cook stirring constantly until browned. This step will go through various stages: first the sugar will lump, slowly turning color from clear syrup to light brown then to amber the color you want. At this point the sugar changes color rather rapidly stop at amber. Do not let the sugar burn. Once the sugar hits the amber color add the butter. Be careful it’s going to bubble up. Stir until melted and cook for 3 minutes. Slowly add cream. Once again, the mixture will bubble up. Continue cooking for another minute or two. Add salt. Stir. Pour into mason jar. I’ve kept it in my refrigerator (if it lasts) for 2-3 weeks. Cut stale bread into bite sized cubes. Place into baking dish. In a medium sized bowl add sugar, cinnamon and eggs. Whip with a whisk. Add milk and vanilla to egg mixture and blend. Pour mixture over bread. Let the bread soak up the liquid for ten minutes. Add ½ cup to 6 oz. of salted caramel and mix. Dab tablespoon sized drops over the bread pudding. Bake for 30-40 minutes in a 350 oven. I love caramel. I love salt. I love salted caramel. I love bread pudding. I love Salted Caramel Bread Pudding. This is a winner in my book. I’ve never heard of salted caramel before, unless it’s like the caramelized potatoes we eat for Christmas. Thanks you for widening my horizon.